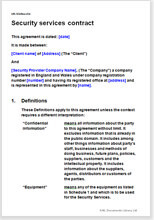 This agreement is useful for both, the security service provider and to the client (which may be an industrial unit, shopping centre, hospital, residential society, school or any other organisations) on payment of agreed fee and the client who wishes to engage the security agency for the security of its industrial or institutional premises. The purpose of this agreement is to regulate the relationship between the client and the security Services provider (which is a company) in connection with the security Services to be provided for the designated premises. The security agency must be professional and offer highly trained and certified guards capable of providing the level of security and protection that suits the client’s’ business and operations and matches the risk potential. The security Services provider and the client both can use this agreement. This agreement provides flexibility by the way of choosing the description of the rendered security Services and option for relevant schedules.